The Vice President, Prime Minister of the UAE and Ruler of Dubai, His Highness Sheikh Mohammed bin Rashid Al Maktoum, said that 'Area 2071' is a bridge to the future, and a platform to implement the UAE’s model for future design; and reflects UAE Centennial 2071 objectives for a better life for future generations with more opportunities to communicate with the rest of the world. Sheikh Mohammed’s remarks came during the opening of ‘Area 2071’, at Emirates Tower, in presence of H.H. Sheikh Hamdan bin Mohammed bin Rashid Al Maktoum, Crown Prince of Dubai and Chairman of Dubai Executive Council, Mohammad bin Abdullah Al Gergawi, Minister of Cabinet Affairs and the Future, Omar bin Sultan Al Olama, Minister of State for Artificial Intelligence, and Abdulla Al Basti, Secretary-General of the Executive Council of Dubai. 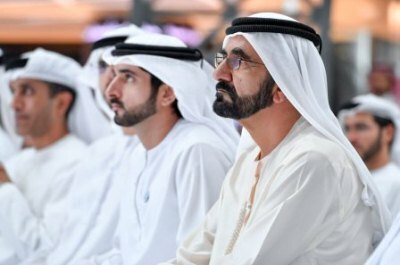 "Today we opened Area 2071, the interactive platform that gathers creative minds, and reflects partnership public and private sector, and innovators to develop creative solutions, implement ideas to serve humanity and design a better future for next generations," Sheikh Mohammed said. "Area 2071 reflects the UAE’s ambition to be a key player in building the future. It is an open laboratory to learn, develop ideas and experiences, and design the future, as well drafting a better future for humanity. Area 2071 was inspired from Centennial Vision announced in March 2017 is based on a lecture by His Highness Sheikh Mohamed bin Zayed Al Nahyan, Crown Prince of Abu Dhabi and Deputy Supreme Commander of the UAE Armed Forces. The aim is to strengthen the country’s reputation and soft power, building Emirati values and ethics for coming generations, and improving the economy’s productivity. The area will "act as an umbrella" to bring together entrepreneurs, start-ups, small and medium-sized businesses, and government programmes such as Dubai’s Future Accelerators. Sheikh Mohammed bin Rashid was briefed about the projects and initiatives executed by Dubai Future Foundations since its inception two years ago, which included 15 initiatives such as Dubai 10X. His Highness was also briefed about 'Museum of the Future', and 'The Office of the Future'.